During the years 2007-2015 Datta was a researcher at the US Army Aeroflightdynamics Directorate (AMRDEC) at NASA Ames Research Center. At Ames he worked on the full-scale wind-tunnel testing of the UH60A Black Hawk rotor that was taken up to advance ratio 1.0 under high speed extreme flow-reversal conditions; developed X3D --- a High Performance Computing (HPC) driven scalable 3D CAD/FEA-multibody software for next-generation aeromechanics analysis, and began preliminary design of all-electric propulsion systems for high-power, high-torque aircraft. Between 2008-2013 he was the technical lead for structural dynamics and CFD-CSD coupling for CREATE-AV/Rotorcraft --- a Department of Defense HPC Modernization Program Office funded program for high-fidelity computational analysis. His pioneering work on the resolution of high-speed vibration and lift-phase errors led to the rise of CFD/CSD as a sub-field in rotorcraft and its adoption today as a high-end government/industry standard. 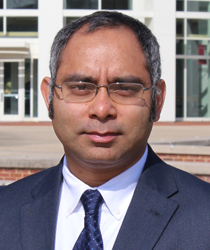 Potsdam, M., Datta, A., and Jayaraman, B., ``Computational Investigation and Fundamental Understanding of a Slowed Rotor at High Advance Ratios,'' in press, Journal of the American Helicopter Society, to be published in 2016. Datta, A. and Johnson, W., ``Power Plant Design and Performance Analysis of a Manned All-Electric Helicopter'' AIAA Journal of Propulsion and Power, Vol. 30, (2), March 2014, pp. 490–505. Datta, A., Yeo, H. and Norman, T. R., ``Experimental Investigation and Fundamental Understanding of a Slowed Rotor at High Advance Ratios,'' Journal of the American Helicopter Society, Vol. 58, (2), April 2013, pp. 022004-1:17. Choi, S., Datta, A., and Alonso, J. ``Prediction of Helicopter Rotor Loads using Time-Spectral CFD and An Exact Fluid-Structure Interface,'' Journal of the American Helicopter Society, Vol. 56, (4), pp. 042001-1:15, October 2011. Datta, A. and Johnson, W., ``Three-dimensional Finite Element Formulation and Scalable Domain Decomposition for High Fidelity Rotor Dynamic Analysis,'' Journal of the American Helicopter Society, Vol. 56, (2), July 2011, pp. 022003-1:14. Falls, J., Datta, A., and Chopra, I., ``Integrated Trailing-Edge Flaps and Servotabs for Helicopter Primary Control,'' Journal of the American Helicopter Society, Vol. 55, (3), July 2010, pp. 1-15. Abhishek, A., Datta, A., Ananthan, S. and Chopra, I, ``Prediction and Analysis of Main Rotor Loads in a Prescribed Pull-Up Maneuver,'' AIAA Journal of Aircraft, Vol. 47, (4), July-August 2010, pp. 1197–1215. Datta, A., ``X3D --- A 3D Solid Finite Element Multibody Dynamic Analysis for Rotorcraft,'' American Helicopter Society Technical Meeting on Aeromechanics Design for Vertical Lift, San Francisco, CA, January 20-22, 2016. Staruk, W., Chopra, I. and Datta, A. ``Coupled Aerodynamics and 3-D Structural Dynamics of the Tilt Rotor Aeroacoustic Model (TRAM) Proprotor,'' American Helicopter Society Technical Meeting on Aeromechanics Design for Vertical Lift, San Francisco, CA, January 20-22, 2016. Staruk, W., Weiner, E., Chopra, I. and Datta, A., ``CAD-Based 3-D Structural Dynamic Modeling of the Tilt Rotor Aeroacoustic Model (TRAM) Proprotor,'' American Helicopter Society Annual Forum 71, Virginia Beach, VA, May 5-7, 2015. Datta, A. and Johnson, W., ``Integrated Aeromechanics with Three-Dimensional Solid-Multibody Structures,'' American Helicopter Society Annual Forum 70, Montreal, Canada, May 20-22, 2014. Staruk, W., Chopra, I. and Datta, A., ``Three-Dimensional CAD-Based Structural Modeling for Next Generation Rotor Dynamic Analysis,'' American Helicopter Society Annual Forum 70, Montreal, Canada, May 20-22, 2014. Datta, A. and Johnson, W., ``Requirements for a Hydrogen Powered All-Electric Manned Helicopter,'' 12th AIAA Aviation Technology, Integration, and Operations (ATIO) Conference, Indianapolis, IN, September 17–19, 2012. Potsdam, M., Datta, A., and Jayaraman, B., ``Computational Investigation and Fundamental Understanding of a Slowed Rotor at High Advance Ratios,'' American Helicopter Society Annual Forum 68, Fort Worth, TX, May 1-3, 2012. Norman, T. R., Shinoda, P., Peterson, R. L. and Datta, A., ``Full-Scale Wind Tunnel Test of the UH-60A Airloads Rotor,'' American Helicopter Society Annual Forum 67, Virginia Beach, May 3–5, 2011. Falls, J., Datta, A., and Chopra, I, ``An Examination of the Eﬀects of Trailing Edge Flaps on Swashplateless Rotor Performance and Wake,'' 36th European Rotorcraft Forum, Paris, France, September 7-9, 2010. Datta, A and Johnson, W., ``A Multibody Formulation For Three Dimensional Brick Finite Element Based Parallel and Scalable Rotor Dynamic Analysis,'' American Helicopter Society Annual Forum 66, Phoenix, AZ, May 11-13, 2010. Datta, A and Johnson, W., ``Large-Scale Domain Decomposition For a Scalable, Three-Dimensional Brick Finite Element Based Rotor Dynamic Analysis,'' AHS Technical Specialists’ Conference on Aeromechanics, San Francisco, CA. Jan. 20-22, 2010. Free, Kumar, Ng and Weinstein recognized as tomorrow’s engineering leaders. AHS International selects alumnus for Bagnoud Award.